The 25th General to lead the world's second largest army is one of its most decorated serving soldiers today, says Group Captain Tarun Kumar Singha, VSM. The environs of South Block beckoned General Bikram Singh on several occasions. After the 'Higher Command Course', he served his first tenure in the Military Operations (MO) Directorate. The tenure, as a director, coincided with the Kargil war and the bright officer was singled out to brief the media on the daily progress of the conflict. 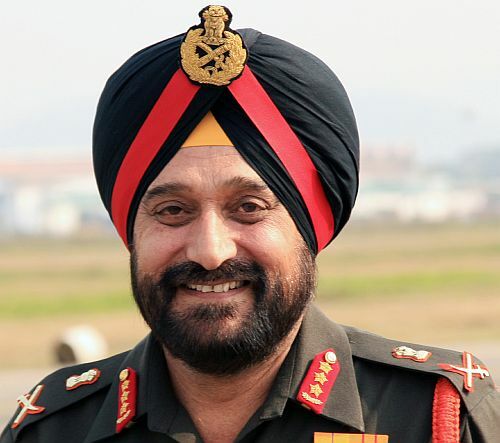 In between 'Staff' roles, General Bikram Singh went on to command several other operational field formations. These include command of a Rashtriya Rifles Sector in South Kashmir, an Infantry Division in Jammu and Kashmir and the prestigious 15 Corps at Srinagar. His international forays with peace-keeping missions include two assignments with the United Nations in Central America (ONUCA and ONUSAL) and as the Deputy Force Commander and GOC of Eastern Division in the Democratic Republic of Congo. His division comprised contingents from 18 different countries including a brigade each from India and Pakistan, and battalions and companies from China, Bangladesh, Nepal, Uruguay, South Africa, Morocco, Senegal, Benin, and Tunisia amongst other countries. What are your priorities after taking over as the Army Chief? My first priority is to ensure the operational readiness of the army to enable it to fulfil its Constitutional obligations and assigned roles effectively. Secondly, address the hollowness and ensure the modernisation process proceeds as per stipulated timelines. Thirdly, strengthen the army -- work culture and the core values, namely, Duty, Honour, Loyalty, Integrity, Respect and Selfless Service. Fourthly, focus on effective human resource management to ensure high standards of motivation and morale amongst all ranks. Fifthly, enhance fitness with other services. Sixthly, ensure welfare of veterans, Veer Naris and widows. It is important that we care for these very valuable members of our fraternity as they constitute the very bedrock of our bigger army family. All commanders must endeavour to create a climate during their command tenures that hinges on our cherished core values, professional ethos and is conducive for growth and cohesion. Your thoughts on issues such as Siachen and AFSPA. Look, I have had two stints each in the Military Operations and Perspective Planning directorates at the army headquarters and as such, I am fully conversant with these issues and the associated sensitivities and nuances. However, at this stage, I would not like to offer any comment on these issues as we (Army HQ) have already forwarded our views to the government and its now for the governement to decide. What are the army headquarters's views? Our views are classified and therefore, I would not like to talk about these. On the army's role in tackling left-wing activities. I am of the view that the army should get employed in internal security situations only as an instrument of last resort, consequent to the optimal employment of state police forces and Central Armed Police Forces, CAPF. It needs to be remembered that our prolonged employment in such situations impacts adversely on our conventional war fighting capabilities and therefore, is best avoided. We need to continue with added zeal and commitment the training of state police forces and CAPFs to give them the requisite prowess to effectively deal with the internal security situations. What type of training is being imparted? We are committed towards training and capability development of CAPFs. Till March this year, the army had trained almost 70,000 CAPF and state police personnel including 38 CAPF Battalions in counterinsurgency operations. Approximately 2,700 personnel have been imparted counter IED training, 140 newly commissioned assistant cCommandants of various CAPFs have undergone six months attachment with army battalions deployed in counter-insurgency operations in Jammu and Kashmir and the north-east and, another batch of 120 officers is presently undergoing attachment. Our endeavour is make these junior leaders proficient in effectively handling their sub units in sub conventional war fighting arena. Group Captain Tarun Kumar Singha is the Chief Public Relations Officer, Defence, based in Kolkata. Will Gen V K Singh's tainted tenure haunt his successor?